Your PC or laptop can play every media format available, from any source. 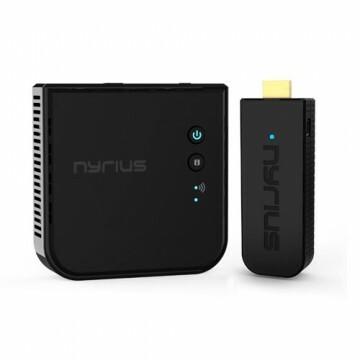 If you already have a collection movies and TV shows stored on your computer, and also want to watch new content from Netflix, Hulu, YouTube, or directly from a broadcaster’s website, Nyrius ARIES™ Pro is the best option for bringing everything to your home entertainment system without running messy cables. You can easily stream 3D 1080p resolution to your HDTV or projector. Bring the gaming experience back to the couch. 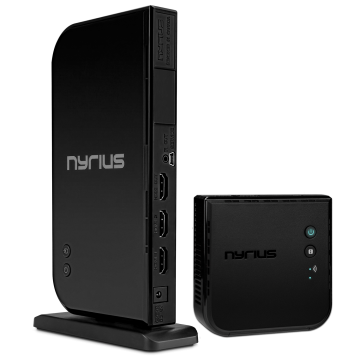 Nyrius ARIES™ Pro has a powerful long range signal that has no latency. You can be confident that when you press a button, ARIES™ Pro will respond with audio and video that is completely in sync with the game, it’s real time. You won’t get “pwnd” by lag from ARIES™ Pro. It’s powered by a USB port on your computer, so you’re not anchored to an outlet, making it easy to sit comfortably while playing. 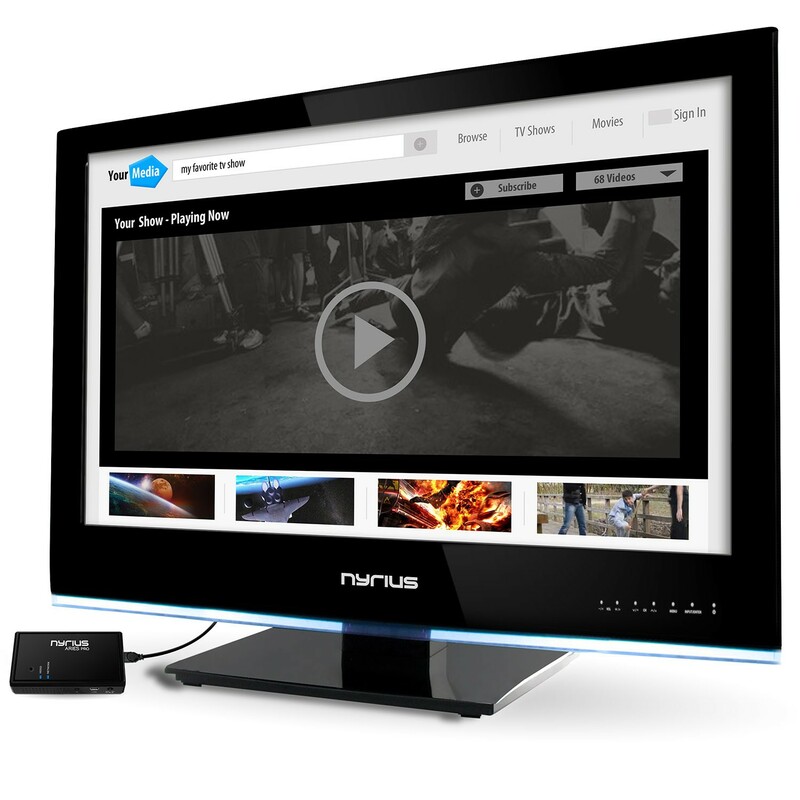 ARIES™ Pro makes it super easy to connect a desktop computer from another room to your HDTV. Simply plug in a wireless keyboard and mouse into the receiver’s USB port (adapter included) and you can have full control of your desktop from your living room. With the flexibility of being able to connect up to 8 transmitters to one receiver, you can also use ARIES™ Pro with devices that have a USB port to power the transmitter. Connect to your PS3, PS4, Xbox 360, Xbox One, satellite or cable receiver and switch between transmitters. This thing is strong. Really strong. 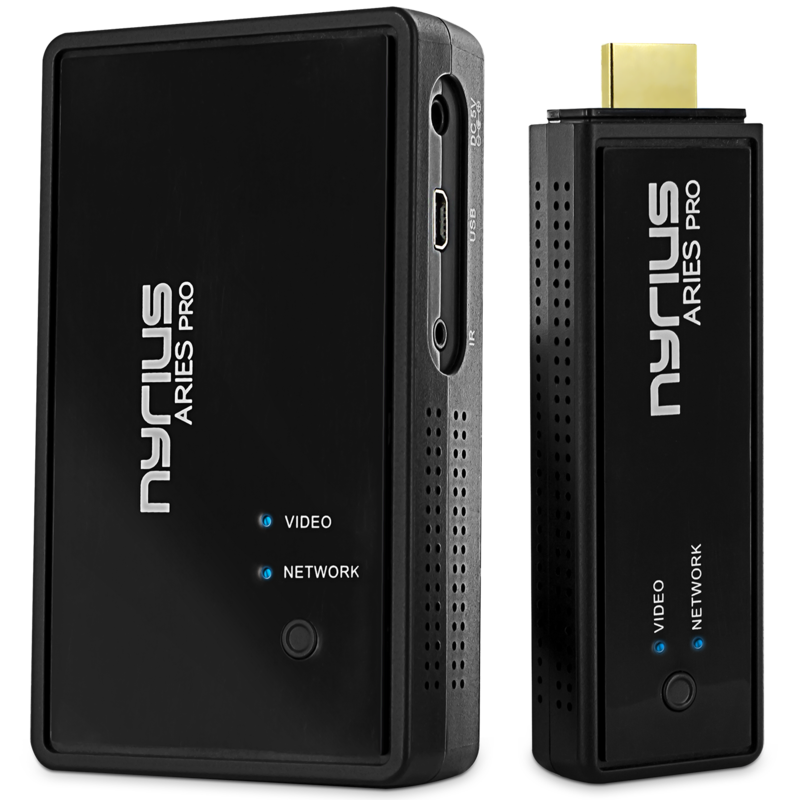 Offering the longest range available in wireless HDMI, ARIES™ Pro can stream uncompressed 3D and 1080p video and audio up to 160ft away passing through walls and floors with ease. 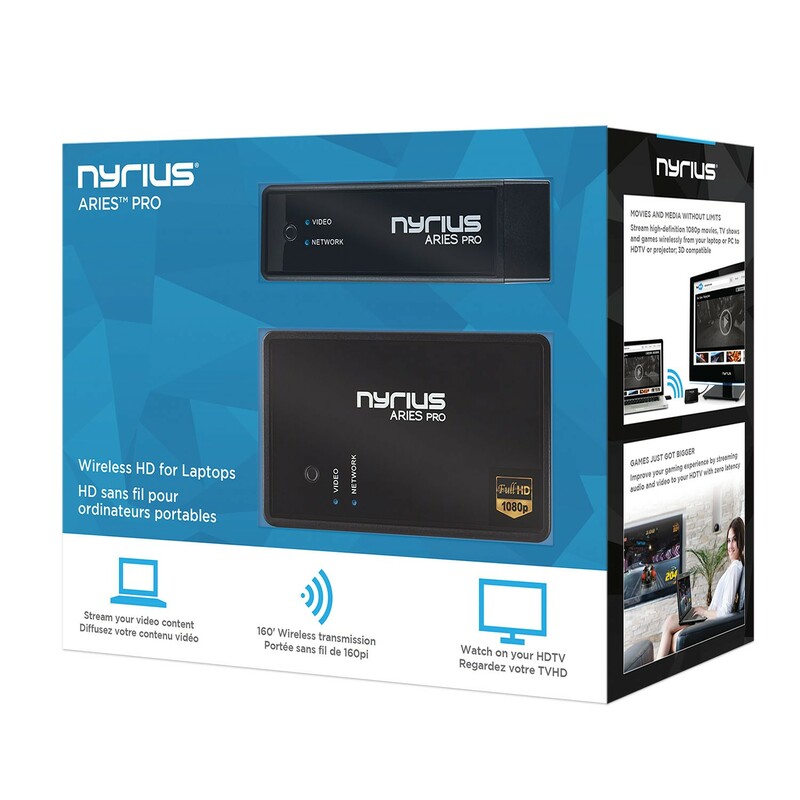 Whether your computer is in the same room or at the opposite end of your house, ARIES™ Pro always transmits razor sharp video and audio without any latency. This powerful digital signal will not interfere with Bluetooth or Wi-Fi signals throughout your home. You want it to be simple, so that’s exactly what we did. There’s no software required for your computer and connects directly into an HDMI port. Pairing a new transmitter is a cinch. 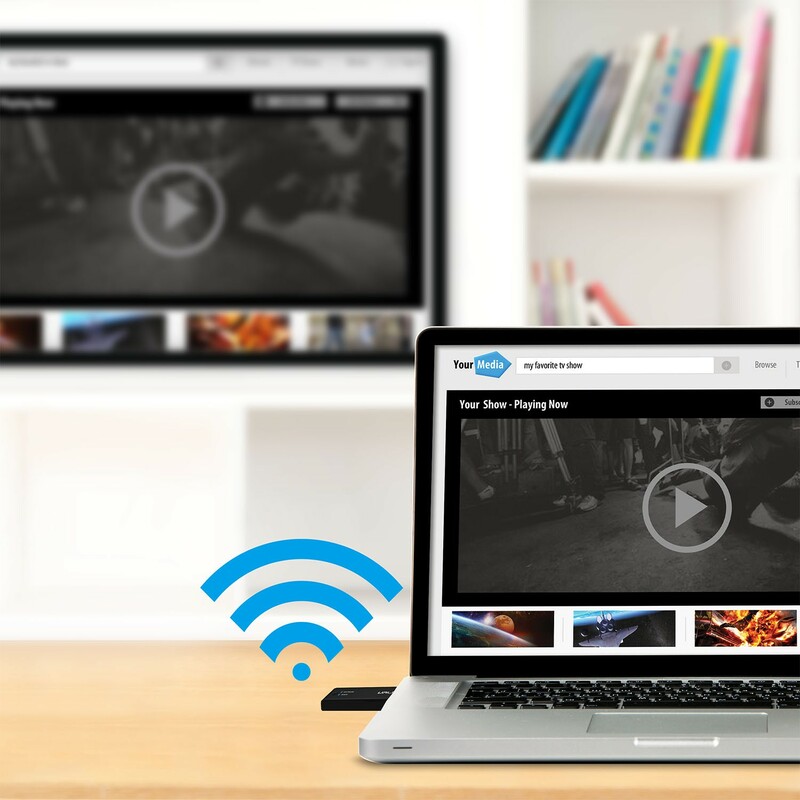 Setup takes only a minute, making it easy to catch up with what’s on your favorite shows. "The Aries Pro delivers a crisp and vibrant 1080p HD signal (and supports 3D), whether you’re transmitting video footage, surfing the web, or playing games. And whatever the case, I didn’t notice a hint of input lag during use, meaning frantic, twitch-based shooters and other tense games are just as playable as slow-paced puzzlers." "The quality of the image is quite stellar"
"If you need to send HD video and audio wirelessly, the Aries Pro is an excellent solution, and at about a $250 street price it's quite a bit cheaper than any of the professional products you'd have to buy to get similar results. Highly recommended." Great product that worked well with minimal/zero intervention for 2 yrs with receiver stuck to back of led tv without being switched. Repeat buy for office in Singapore and great help from whitney at customer service. Not sure though why extra transmitter is no longer available like my purchase 2 years ago with 3 transmitters and it was usd250/set then and now usd399 though whitney helped again to advise on 10% discount code. Nyrius Aries Pro is simply awesome, very easy to setup, been using it for over 6 months now, haven't used any other brand but I am very happy with the quality, it has a good throughput to the Large TV from my laptop both which are in a medium sized conference room...Overall very satisfied...Also, Berenice from CWD Sales and Service was professional, courteous and very helpful in resolving my issue after upgraded to Win10..just had to restart the receiver from the TV..would recommend this device for HDMI wireless connectivity. This item works great. That's the main thing. I had tried 2 other systems previously for courtroom presentations. It was always a crap shoot on whether they would work or not. This one does, plus I really like the usb power of the transmitter as it cuts down substantially on AC cord clutter. I needed a wireless HDMI transmitter and receiver for a long time but didn't want to spent a lot of money. When I found this one I knew I have to give it a try. It don't have the strongest signal as I would like it to have but will do for the price and it did the job that I needed it to do. Worked great straight out of the box. We're using this in the boardroom to eliminate all of the cords. Liked it so much, I bought a 2nd for our other meeting space. Anyone looking for a multiple-platform solution for displaying content on an HDTV should take a close look at this product. I don't know if anything can touch it for the money. I have an Apple TV for Macs (doesn't work easily with all) a Intel WiDi receiver (very spotty) and of course, HDMI cables. This one device replaces everything. It even comes with a remote IR detector so you can mount it behind the HDTV. A true Plug-n-Play device. The only complaint I have is the remote either has a dead battery out-of-the-box, or there is an issue with it. I'm replacing the battery today and will find out. I used it with Sony laptops (built-in HDMI) and with Mac book Pro laptops and with the Surface Pro tablet. The Mac Book Pros and the Surface Pros both use the same Mini-Display to HDMI adapter. All worked perfectly. Picture quality is superior to both the WiDi and the Apple TV, hands down. A little tweaking of the HDTV to compensate for slight over-scan and DONE! We are ready for any situation in our conference room. Easy to setup, works out of the box with little or no latency and great picture. Would love to obtain more than the 1 additional transmitter purchased for additional devices but prohibited by the price of these transmitter at 2/3 price of initial receiver-transmitter purchase. For anyone on indie film/video production sets this is a handy tool to have in your bag. If you are operating a camera and don't want the director hanging over your shoulder it will provide you working space while giving him the ability to see what you're shooting. 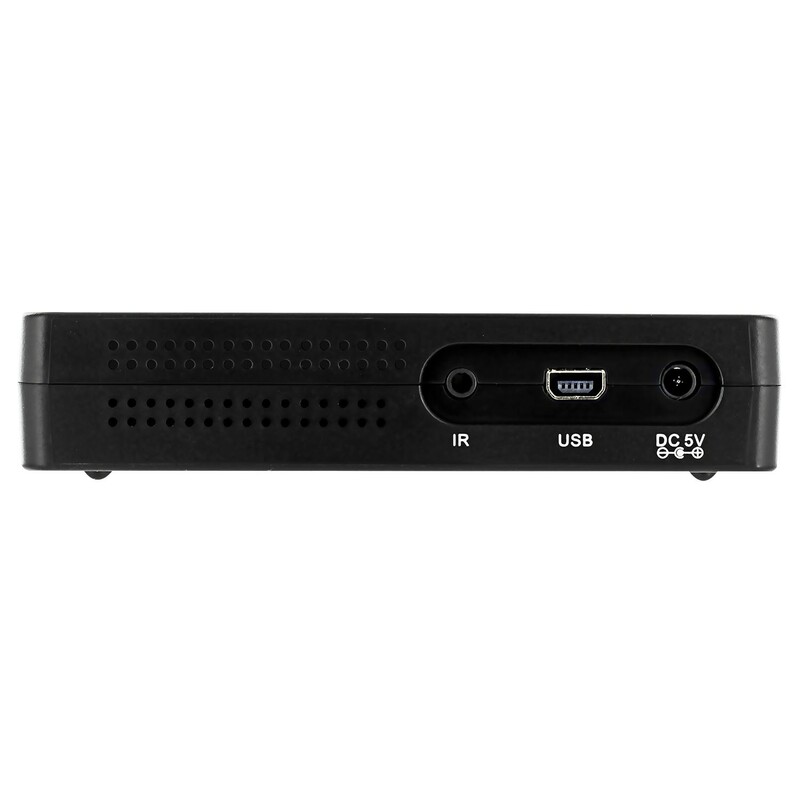 Both the HDMI transmitter and receiver require additional power so you will need to plug-in more than just the HDMI. The transmitter's power connector is a mini-usb while the receiver is a 3.5mm barrel plug. I use SmallHD field monitors and I was able to power both (one on each monitor) the transmitter and receiver by plugging them into the SmallHD DP6's USB connection. 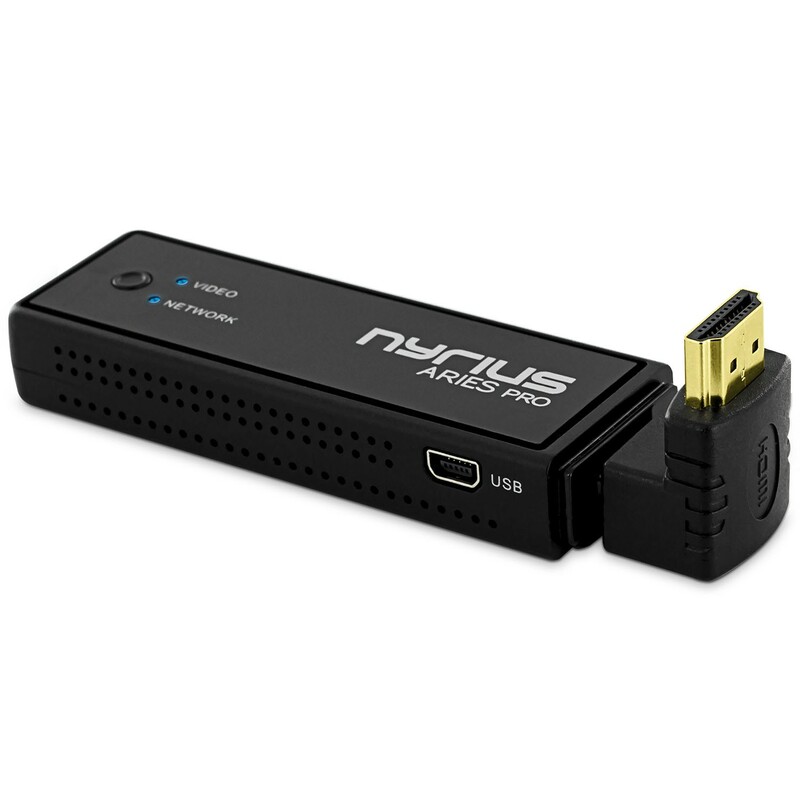 The receiver required a 3.5mm barrel plug to USB cable which isn't provided with the Nyrius. We jhave been trying to solve the connection from our video sources to our projector - a line of site distance of about 75'. Installation and hookup took minutes. After turning the system on, connection took less than 5 seconds. We have used this system only a few hours, but in that time, we have had not dropouts, and the video has exceeded our expectations in resolution and color accuracy. Sitting with at least 75' between the PC with the transmitter and the projector with the receiver, I could watch both displays. If there was any latency, it was barely detectable. Less than 1/10 second it that much. We are not using the audio over wireless. We have no way to gauge reliability yet, but for sure this system really works! 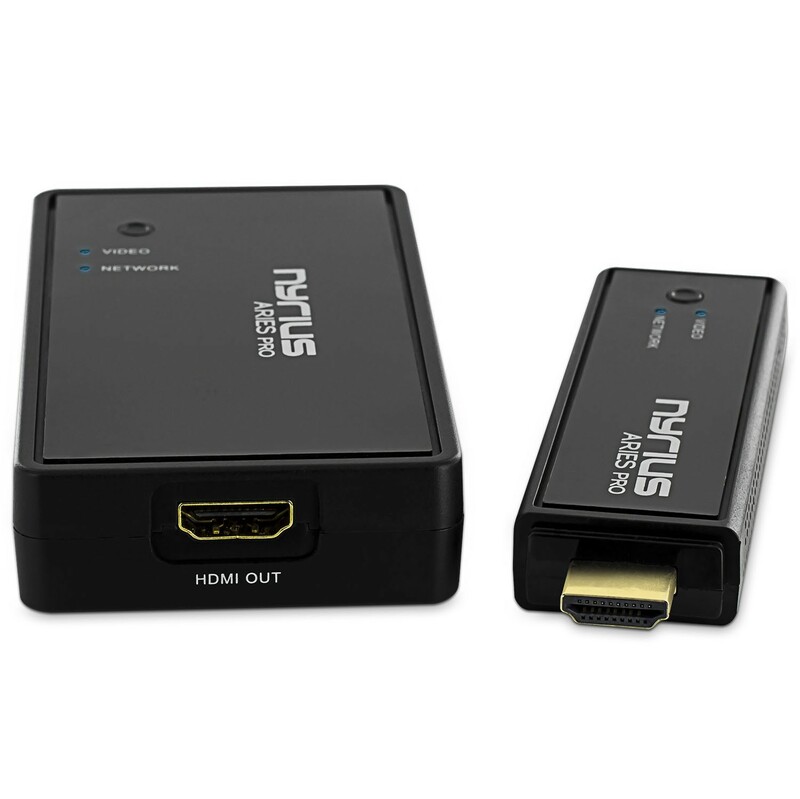 Remember to buy VGA male to HDMI female converter if your laptop does not have HDMI port. Also you will need to buy HDMI female to DVI male if your projector does not have HDMI in but has DVI in. I ordered this product internationally as I couldn't find any other item in its transmission and price range. - It does include a switching power adapter so you only need an adapter for the plug in your country. I expected such an adapter to be included as I explicity ordered the product internationally. 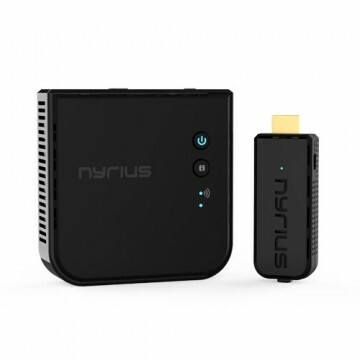 - Nyrius decided not to include the remote proposed in the manual in recent shipments. They explained to me that one would be included with every additional transmitter. For me that doesn't make much sense, as the remote belongs to the receiver and if you purchase multiple transmitters you end up having multiple remotes you don't need. And you can't change the name of your video source without a remote. - The product only ships by UPS (in my case WW Expedited). Besides taxes, UPS collected an additional so called brokerage fee (roughly $15). It could have been shipped by DHL or USPS as well, saving some money on shipping as I didn't have an urgent need for it. It's a good working HDMI transmitter and receiver. I rated it 4 stars because the picture itself does look kind of compressed, which is a loss of picture quality. The range is very limited as well, might need to purchase an extender. Also, this device gets pretty hot. I almost never never write reviews. unless they are bad, or unless they are amazing. this was plug and play... so so effortless. amazing quality and so easy. this makes you feel that technology rocks!! make sure that you have proper female/male HDMI extensions, in case you hook this up to your desktop PC. The video cards on some (probably most) PCs do not have a lot of space in the back, like stereo/AV equipment does, so you need proper HDMI extensions. The case comes with a cool HTML L-extension (to corner), and also 2, yes I said 2, USB connectors.